LaRue Tactical, a highly respected manufacturer of precision rifles and accessories, has finally introduced their first fire control group for the AR platform, with their new MBT-2S (Meticulously Built Trigger – 2 Stage), or MBT for short. They released this trigger back in late 2014, and gave away the first 100 triggers leading up to Christmas. 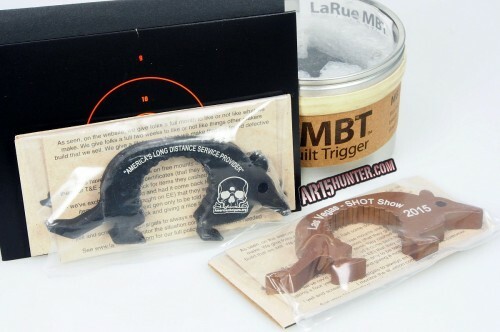 When we first picked up our MBT from LaRue, and did our unboxing (see the video here), the first thing we noticed is that this is a very well made trigger. The S7 tool steel construction gives it a, “built like a tank” feel, and you can see the attention to detail in the machining of this trigger group. The trigger is greyish purple, with a matte like finish. Above you can see the MBT prior to install. LaRue engraves each trigger with markings indicating what trigger it is, along with a build code (0215). 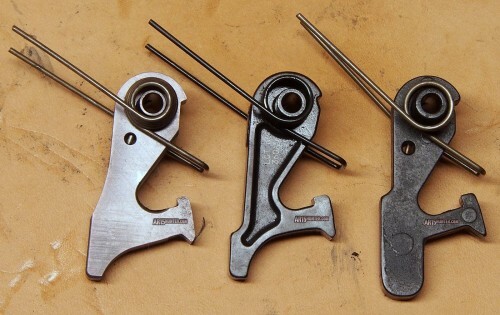 They include all of the necessary parts, including trigger pins, springs, and a good manual to help those unfamiliar with changing out a fire control group. No grease or other lubricant is included. Here we can see just the trigger with the pinned disconnector and supplied trigger spring. Like many other AR15 triggers, the hammer uses a J spring to retain the hammer pin, and the hammer spring legs help keep the trigger pin in place. 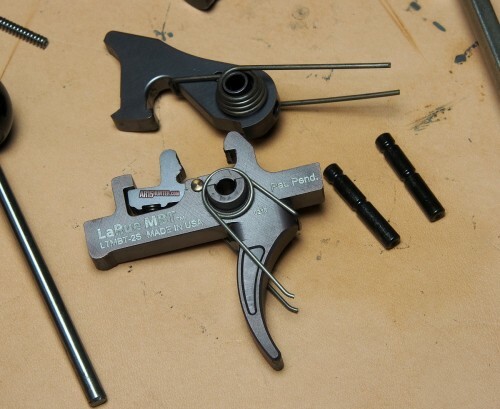 I believe LaRue is even making their own hammer springs for this trigger group. Here you can see the MBT compared to a few of my other 2-stage triggers. From left to right we have the LaRue Tactical MBT-2S, Geissele Automatics Hi-speed NM DMR, and Rock River Arms 2-stage Varmint. Above are the hammers from the same three triggers: MBT-2S, Geissele Hi-speed DMR, and RRA 2-stage Varmint. 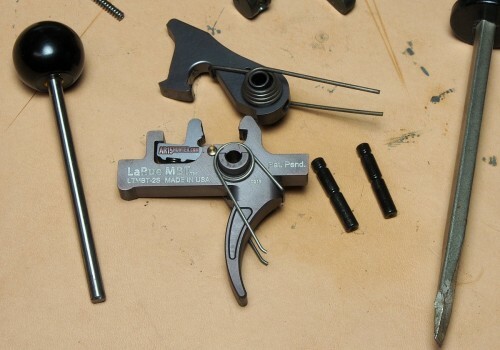 The installation of the LaRue MBT trigger was a snap. The pinned disconnector makes for one less piece in the puzzle, and once you have removed your grip and safety selector items, the trigger drops right in. The hammer springs are strong, so you’ll have the most “trouble” with the hammer, which is typical with most all AR FCGs. The instructions note the grease points, and our trigger looked to have a slight amount of lubrication on the bearing surfaces from the factory. However, I still applied a small amount during installation. Once installed, I did a quick function check, and then proceeded to reinstall the safety selector items and grip. At that point, I did quite a few dry fire exercises, and right off the bat I was liking what I was feeling. The MBT has a short and smooth first stage, or take up as some call it, and you hit a defined wall that is the second stage. With a bit more pressure (approx. 2LBS according to LaRue), the trigger breaks with a very crisp feel, dropping the hammer. The reset was positive, with a strong “click” that could be felt and heard easily. However, the reset pressure (the spring tension you feel on your finger as the trigger is wanting to move forward) was very light (more on that below). 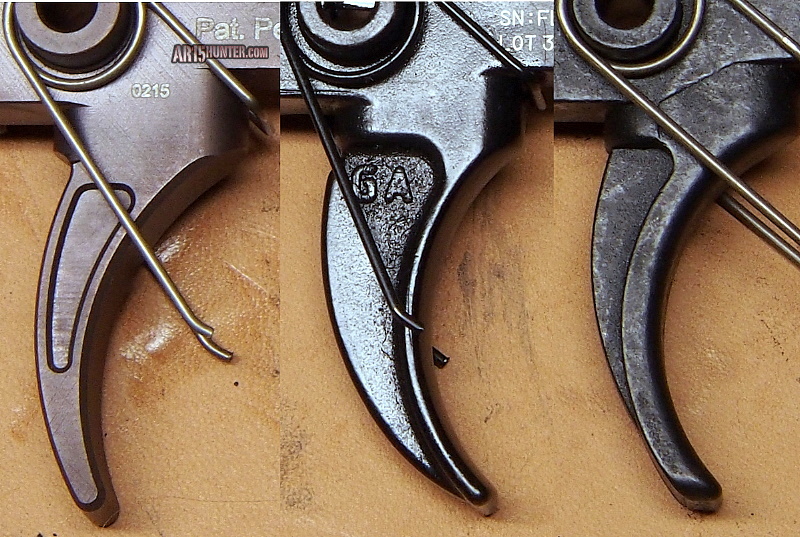 Trigger bow comparison between the MBT, Hi-speed DMR, and 2-stage Varmint triggers. The trigger bow itself does not have the same curve as a standard trigger, as it has a longer radius (i.e. it’s a flatter trigger bow). To me, this bow sits in-between that of a flat, and curved trigger bow. The bow is also wider than most, which I actually like very much, due to having large hands. The matte finish of the trigger allows it to grip your finger better than other triggers that have a smooth or polished bow. My only complaint about the trigger’s bow are the edges. They are a bit sharp, which could cause some discomfort during long durations of use. I personally would probably hit the edges with a stone a few times to remedy this. Per our usual routine, I pulled out my Lyman electronic trigger pull gauge and proceeded to do some testing to see where this trigger was at. Right from the start the trigger felt quite light to me, which I actually like for a hunting trigger. Whether I’m out shooting long range prairie dogs, or testing a new hunting load, I like a light, crisp trigger. LaRue advertises this as a 4.5LB trigger, however ours was breaking a good deal lighter than this, closer to 3 3/4 – 4LBS. This is actually my preferred weight range for my hunting rifles, and it’s right in line with several of the MBT’s competitors (RRA Varmint, Geissele SSA-E, etc.). The next step was to get to the range, and really see how it feels during some live fire. As recognized during dry fire practice, I really liked using this trigger. The wider footprint of the trigger bow is very comfortable, and the short first stage and crisp second make it easy to place quick and accurate shots. The second stage break is very pleasing, in fact it’s one of the crisper breaks that I’ve felt on a nonadjustable trigger. I used this trigger to shoot some groups with some barrels I have in for testing, and it allowed me to produce some very nice, consistent groups at 100 yards. LaRue Tactical has done a fabulous job with their MBT-2S, especially when you consider this is the first trigger they have ever created. The build quality is excellent, with LaRue using high-quality materials that are machined very well. It definitely lives up to the “Meticulously Built” name. I have no problem recommending this trigger to fellow AR15 Hunters, as it offers a light pull with a very crisp break; both of which are things I look for when considering a trigger for a hunting rifle, whether I’m hunting small or large game. My only real complaint about this trigger, other than the sharp edges of its bow, is the reset. While it’s a very positive reset, and the length of the reset is on par with other 2-stage triggers I’ve tested, it’s too light for my liking. The pressure on your finger while releasing the trigger forward is very soft, and many times I found myself hunting for the reset. I think this could be easily remedied with a stronger trigger spring, but as I continued to use the trigger and get used to the reset, it became less and less of an issue. With a MSRP of $250, the LaRue Tactical MBT-2S is competitively priced. It is right in line with similar triggers currently available, and when you consider the quality materials they are using (like the S7 tool steel which claims to offer superior durability to other materials), you can see why it costs more than some options out there. 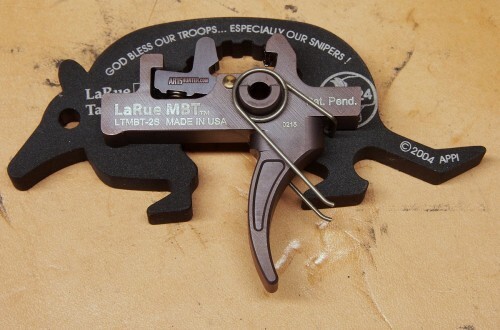 Update 06/26/2015: LaRue Tactical has just lowered the price on their MBT-2S to just $199. This is not a sale price, but rather the actual retail price. While we noted that the MBT was competitively priced at the original $250 price point, now it is one of the most affordable options in its class, making it one heck of a bargain for the quality and performance you are receiving. Kudos to the folks at LaRue Tactical. Update 11/3/2015: LaRue is now shipping their MBT trigger with both the original and a new “Heavy” trigger spring. 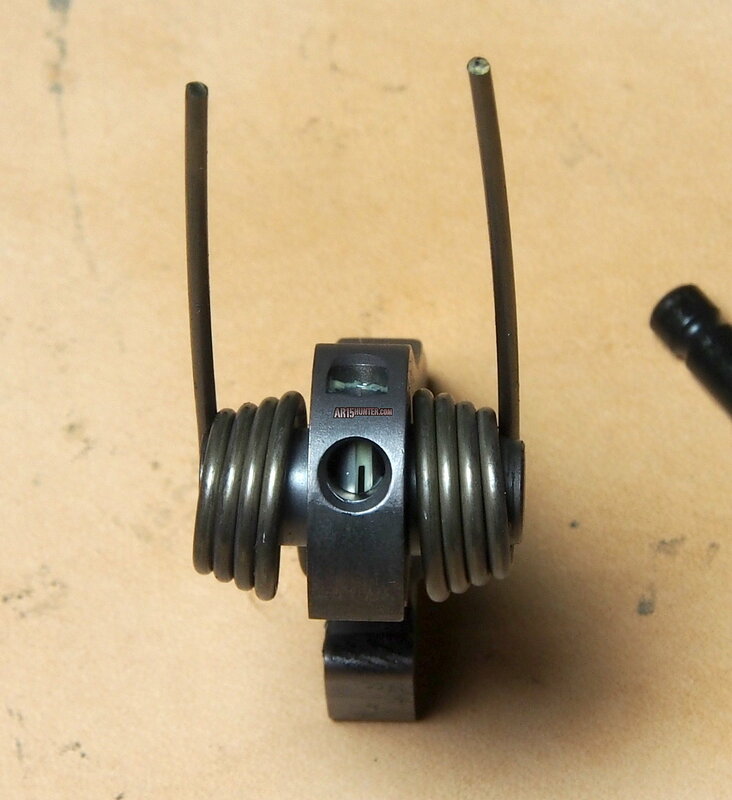 They were kind enough to send me one of the heavy springs to use with the MBT in this review, and it made a noticeable improvement to the reset; providing more forward pressure on your finger that guides you to the reset. It also adds about 1 pound to the total pull weight (taking it up to 4LBS 12-13OZ in my tests). Overall this is an awesome addition, which will allow you to tailor the pull weight to your liking. While I liked the reset better with the Heavy spring, I opted to keep the original trigger spring installed as I prefer the lighter pull weight. Visit the LaRue Tactical website to order yours. Alongside the release of this review, we started a giveaway on our YouTube channel. Subscribe to our channel and you’ll be entered automatically into a giveaway with the possibility of winning two exclusive LaRue Tactical Entry Beverage tools (aka Dillos), along with a $75 LaRue Tactical gift card (the MBT pictured below is not included). The winner will be drawn on April 10th, 2015. This giveaway has ended.